The Deluxe High Back Brushed Stool Cream is perfect for anyone who wishes to keep their room light, bright and cheerful. As its name suggests, this is a divine design with comfort in mind, bringing simple sophistication to your bar area with astounding ease. 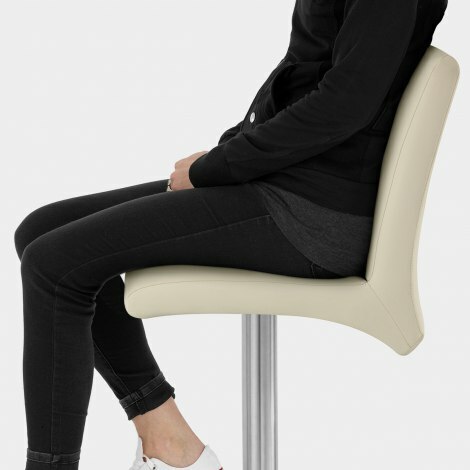 The seat, covered in cream faux leather, has an extensive backrest and comfortable padding, most suitable for those who require that extra support. The seat is perched upon brushed steel framework, and affixed is the handy T-bar footrest. The gas mechanism is incorporated within this, so the owner may choose their preferred height. From this arises the 360-degree swivel feature, so from every angle of your room, its beauty is recognised. The circular brushed base completes this stool, adding stability as well as guarding the floor from damage, with its protective rubber ring. Well pleased with my new stool, good product and good service. As always when ordering on line you are not sure what the actual product will look like. I was thrilled to find these bar stools were accurately depicted on line. I absolutely love them. The service was quick, next day delivery, the quality is great and very easy to put together. They look absolutely fabulous in my kitchen. Really pleased with 3 stools I ordered. One did arrive with a mark on the seat however after sending an email to customer services had a very prompt response & they delivered a new seat within two days. Really lovely chairs & excellent customer service. They seem well made and easy to put together. Not had much use yet so cant comment on the durability. Best thing is they go low enough so i can use them as extra dining chairs if needed. Delivery was very quick. Great stools, expensive but worth the price. Added stylish look to our new modern kitchen.